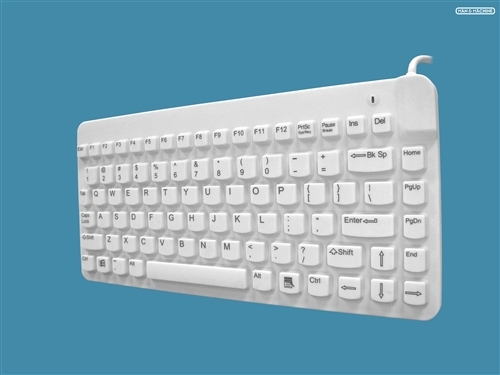 Man & Machine's smallest keyboard upgraded to include the Multi-Level Backlight and MagFix Magnetic Attachment System features. The Slim Cool is a 12 inch wide Medical Grade, water-resistant keyboard with tactile feedback keys. The sealed and rigid surface is ideal for industrial, marine, and medical use, as well as other applications where moisture, cleaning, and durability are a consideration. Because the Slim Cool is also quieter than "standard" keyboards, they are great for applications where noise generated from “key-clicks” is a problem. The Multi-Level Backlight works great in dark places allowing you to control the level of brightness on the keyboard when working. 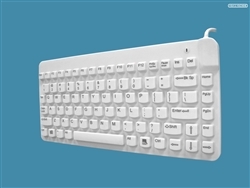 The MagFix feature uses magnets to secure the keyboard to metal surfaces or trays such as on wall mounts with flip-up keyboard trays.